Capacity 5,5 g / 0.19 oz. 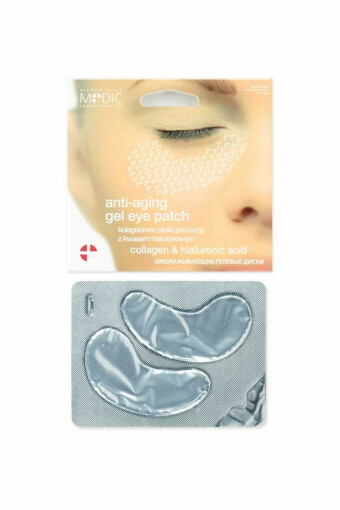 Innovative hydrogel eyepatches. Effective solution for curing under eye problems, such as: discoloration, swelling and ageing of the skin. Thanks to modern hydrogel technology, active ingredients can penetrate the deepest layers of the epidermis. The high content of care ingredients (hyaluronic acid, collagen and panthenol) complements their deficiencies in the skin, providing an immediate effect of skin rejuvenation. Effectively moisturise and nourish the skin, leaving it soft and flexible. Instantaneously eliminate signs of tiredness and the stress effect by restoring the skin under the eyes to show natural freshness and radiance. Visible effects after just one application. HOW TO USE: Carefully open the aluminium bag and remove the patches. Put them on dry, cleaned skin under the eyes. After 20–30 minutes, remove the eyepatches, gently massage the excess of the product into the skin, until completely absorbed. To enhance the effect, the patches may be cooled in the fridge before treatment. Eyepatches should be applied just after removing them from the packaging. In order to achieve lasting effects, the rejuvenation eyepatches should be applied 1–2 times a week. Disposable use product.